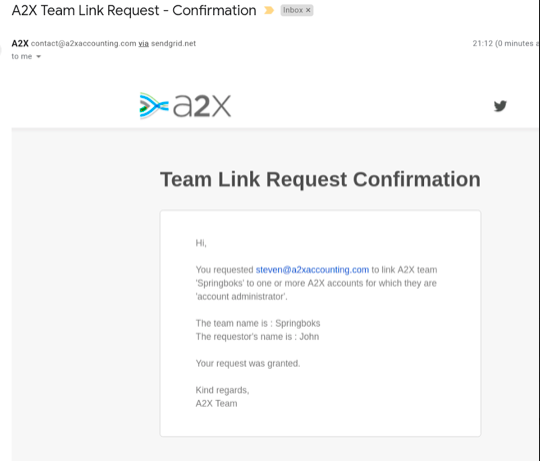 Teams - How can I link a team when my client is the account admin? 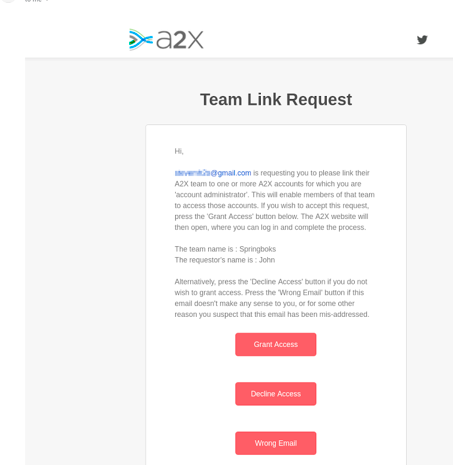 Outlines how to add at team when the A2X account admin is the client. Sometimes Accounting and Bookkeeping firms have clients that are the account admins however the Accounting/Bookkeeping firm would like to add one of their internal teams to the account. Follow these steps to do so (please note that this functionality works for all situations whereby a user would like to add a team but the user IS NOT the account admin). 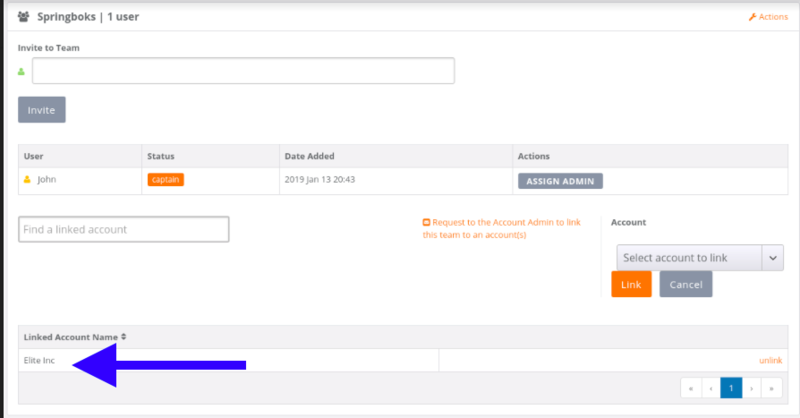 Enter the email address of your client/user whom is the account admin and select 'Send Email'. The "initiator" (you) will get a copy of the email sent to the account admin, but do not try to click on the buttons. The email is just for the initiator (your) records. The client (account admin) will select 'Grant Access'. The invite is only valid for a number of days, and can only be used once. Granting, denying and pressing "wrong email" (that button in the invite email) all count as "using" the invite. The client will proceed to login and would then need to accept the team request for the given account for which they are account admin. 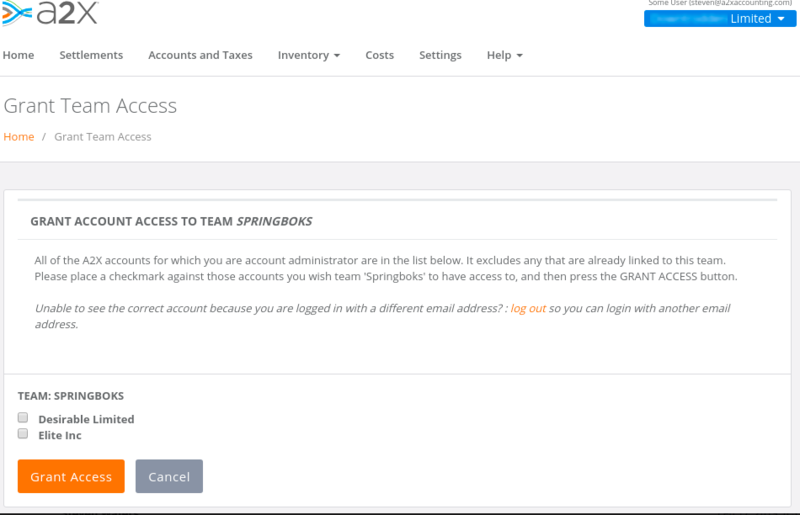 The client will then select the accounts they wish to give access to the team to and then select 'Grant Access'. A confirmation email will be sent to the initiator of the request (Accounting or Bookkeeping firm). 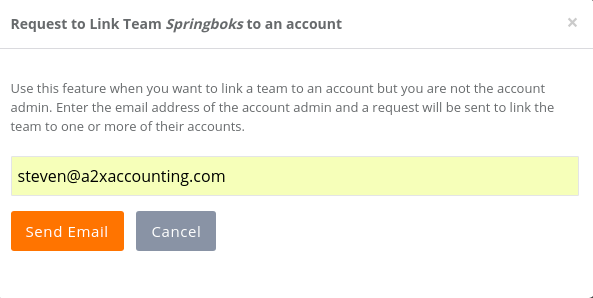 For the Accouuntant/Bookkeeper - The new team will now show the account that has been linked via this process. This can be checked by navigating to Teams->finding the correct team and viewing the account below OR by navigating to the account and viewing the team. For a general overview of how teams works please refer to the teams article here.